What Else Can I Expect From an Online Certificate in Medical Office Administration Program? What Can I Do With a Medical Office Administration Diploma? As the baby boomer population ages, medical administrative careers are expected to grow as much as 23% by 2024. Now is an excellent time to pursue a career in medical office administration and take advantage of the healthcare industry's upward trends in employment and annual earnings. This guide will help you navigate curriculum requirements and career paths so you can choose the best medical office administration certificate program for you. Although courses vary by school, most medical office administration certificate programs require the following core courses. These courses teach skills crucial for careers in medical office administration, such as typing skills and familiarity with medical terminology. Keyboarding: Students learn the most efficient keyboarding techniques, including touch typing and use of special keys. Students gain skills in medical document typing with an emphasis on speed and accuracy. Keyboarding skills are necessary for positions as medical receptionists and medical transcriptionists. Medical legal issues: This course explores moral and legal issues that impact healthcare personnel, such as patient confidentiality and medical office liability. Students examine the relationship between ethics and the law and explore acceptable ethical behavior in medical environments, preparing for careers as medical bookkeepers and schedulers. Medical terminology: This course explores the language of medicine and introduces students to medical vocabulary in areas such as anatomy, physiology, and pathology. Students learn the prefixes, suffixes, and root words used in medical language, important knowledge for health information associates and medical review assistants. How Long Does it Take to get an Online Certificate in Medical Office Administration? An online medical office administration certificate typically requires 18 to 20 credits, which full-time students complete in two semesters. Part-time students who take one course per semester complete the program in approximately three years. An online diploma in medical office administration requires 40 to 50 credits, depending on the program. The student's prior experience and prerequisite requirements also influence completion time. Online certificate or diploma in medical office administration programs may be individually paced or cohort-based. Individually paced programs allow students to work independently. This flexible approach to learning is popular among online programs and emphasizes convenience and self-motivation. Cohort learning takes a community approach; students enter and progress through a program together, emphasizing group collaboration. Established in 1963 through a state legislative act, Lenoir Community College enrolls 14,000 students through its main campus, extension schools, and distance education programs. The institution offers more than 50 programs, including an online medical office administration certificate in medical coding, billing, and insurance. The curriculum totals 15 credits and includes two classes in medical terms. Students learn vocabulary common in medical office settings, including terminology related to pathology, disorder remediation, systemic components, and parts of the human body. They learn to define these terms and apply them in patient documents and external reports. Students pursuing their medical office administration certificate online also explore the billing cycle through coursework emphasizing form preparation and third-party payers. In addition to learning coding fundamentals, students develop the skills necessary to use the three major diagnostic and procedural coding systems. Graduates often pursue entry-level positions as medical billers, certified professional coders, and medical transcriptionists. Graduates can bolster their career opportunities by earning an online associate degree in medical office professional or medical billing and coding through LCC. LCC delivers online courses asynchronously through Moodle. Students can earn the medical office administration certificate online or in a hybrid format. Applicants must submit official academic transcripts. LCC does not require a minimum GPA or standardized test scores; however, admitted students with a GPA below 2.2 must complete an online orientation process. In-state students pay discounted tuition rates, and online learners can qualify for financial assistance, including scholarships and childcare grants. Based in Asheboro, North Carolina, Randolph Community College offers many fully online programs, including online diploma and certificate in medical office administration programs. These two programs help students develop the core coding and billing skills needed to work in hospitals, medical supply companies, private clinics, and insurance companies. RCC graduates often secure positions as office administrators, patient services specialists, and research assistants. Students earning the medical office administration certificate online complete 18 credits of coursework in areas including office terms and legal issues. Students apply knowledge of pathology, conditions, and disorder remediation to complete medical insurance claims. They also learn to perform standard medical office tasks, including data entry and professional communications. Additionally, students prepare to schedule patient appointments and manage the financial aspects of an office. The 36-credit diploma program builds on core concepts and skills through classes that emphasize written communication. Students learn to implement rhetorical strategies and craft theses based on the intended audience and document purpose. Through an office editing class, learners develop comprehensive revision skills, including proofreading and using reference materials to make final edits. Graduates of the certificate or diploma program can apply completed coursework toward the college's associate of applied science in medical office administration. International applicants must send transcript evaluations officiated by the National Association of Credential Evaluation Services, a medical history form, and proof of adequate financial support and English proficiency. RCC charges affordable, per-semester tuition rates based on residency status. Online students receive access to financial aid, including institutional scholarships, state grants, and childcare support. Founded in 1965, Craven Community College operates three campuses and enrolls more than 3,200 curriculum candidates and 10,000 continuing education students each year. The school delivers online coursework through Moodle and offers fully online certificate and diploma programs in medical office administration. Through flexible and comprehensive curricula, students develop the technical skills and healthcare knowledge they need to work as billing specialists, patient representatives, medical transcriptionists. Students earning their medical office administration certification online can choose from three concentrations. Students pursuing the generalist concentration develop keyboarding skills and knowledge of medical terminology and emerging healthcare trends. The patient services representative concentration emphasizes communications and relationship building. The medical billing and coding concentration includes classes in procedure and diagnostic coding systems. The medical office administration diploma requires 42-44 credits, which most students complete in three semesters. Students develop skills in computer literacy, medical terminology, and office procedures. They also explore topics including record management, text editing and formatting, and medical computer applications. The diploma program culminates in an office simulation experience. Applicants must hold a high school diploma or GED. Admitted students complete a placement test and orientation process. Distance learners pay affordable tuition rates based on residency status. Students can apply for all 80 of the college's scholarships through one online application. CCC maintains transfer agreements with state universities and offers career guidance. Established in 1964, Surry Community College is located in North Carolina and enrolls more than 3,200 students in campus-based and remote academic programs. SCC offers an online medical office administration certificate that requires 17 credits and prepares learners for entry-level jobs in medical transcription, office reception, and insurance billing. Many graduates work in dental offices, community health centers, and specialty clinics. Students earning their medical office administration certification online develop keyboarding skills, with emphasis on accuracy and speed. The curriculum trains learners in medical text entry and formatting relevant to memos, letters, tables, and official reports. Coursework also covers medical terminology and records management. Candidates examine alphabetic, subject, and numeric filing methods, while learning how to maintain, protect, and properly dispose of paper and digital records. Online students complete asynchronous classes through Moodle. Learners can attend some classes on the Dobson campus for a hybrid learning experience. SCC also offers a degree and diploma in medical office administration, along with dual-enrollment options for high school students. SCC maintains an open-door admissions policy and does not require a minimum GPA or standardized test results. Prospective students submit an online application, complete placement testing, and apply for financial aid. In addition to offering affordable, residency-based tuition rates, SCC provides foundational scholarships and veteran assistance. Based in Raleigh, North Carolina, Wake Technical Community College enrolls more than 74,000 students, making it the largest two-year school in the state. The college offers 200 academic programs, including remote options such as the online certificate and diploma in medical office administration programs. Wake Tech students gain the fundamental skills needed to secure entry-level positions as front desk secretaries, patient service representatives, and medical billers. Graduates also qualify to earn professional certification from organizations such as the National Healthcareer Association. Students who pursue their medical office administration certification online complete an 18-credit curriculum that covers topics including medical office terms, insurance, and billing. Learners develop technical skills in computer text entry, formatting, and spreadsheets. The program culminates in a medical office simulation, during which students demonstrate core competencies through problem-solving. The Wake Tech diploma program requires 36 credits. In addition to the courses required for the certificate, diploma students take a class in medical legal issues. Students learn about professional liabilities, legal requirements for medical practice, and the supportive but complex relationships between patients, physicians, and staff. The diploma program culminates in a capstone course, in which students synthesize communication, office management, and electronic health records skills through practice and presentations. Applicants submit an online application and complete placement testing. Students work with an academic adviser to finalize their course schedule. North Carolina residents receive discounted tuition rates. Wake Tech facilitates institutional and external scholarships and provides dual-enrollment opportunities for high school students. Founded in 1961, Fayetteville Technical Community College enrolls more than 41,000 students annually. The school offers 190 academic programs, including online certificates in medical office administration. FTCC delivers online courses asynchronously through Blackboard. The college also offers hybrid and weekend classes on campus for students looking for in-person networking opportunities and hands-on learning experiences. FTCC offers four medical office administration certificate online programs. The patient services representative certificate requires coursework in medical office terminology and legal issues. Students pursuing the certificate in dental office specialist learn industry-specific coding, billing, and management skills. Online students can also earn the medical coding specialist certificate, which requires advanced classes in procedure and diagnostic coding, along with a capstone course that prepares students for professional license exams. FTCC offers dual-enrollment options through the High School Connections program. North Carolina high school juniors and seniors can take free college classes to prepare for entry-level jobs or to earn credits to apply toward transfer pathways. FTCC offers an online medical service administration and healthcare customer service certificate specifically for eligible high school students. The curriculum totals 15 credits, which students complete in two semesters. FTCC maintains an open-door admissions policy and requires only an online application and academic transcripts. Prospective students work with an individual adviser to complete a placement test, apply for financial aid, and finalize their class schedule. The college offers low tuition rates and ample funding opportunities. Wayne Community College was founded in 1958 as an industrial education center. Today, the school enrolls more than 14,000 students in diverse academic programming, including four online certificate programs in medical office administration. The U.S. healthcare system continues to expand, due largely to changing legislations and the urgent needs of an aging baby-boom population. The WCC program trains students to work in this growing industry as medical transcriptionists, billing specialists, and office receptionists. Students pursuing their medical office administration certificate online can choose a generalist path, which requires 17 credits in classes such as medical terminology and records management. Students also develop skills in word processing, data entry, and formatting. Alternatively, distance learners can pursue a medical scribe certificate, which emphasizes communications skills. This track prepares students to obtain industry credentials through organizations such as the American Healthcare Documentation Professionals Group. WCC also offers an online medical insurance certificate. Students in this program learn about the entire insurance life cycle and develop diagnostic and procedure coding skills. Students can also choose the dental office administration certificate, which includes coursework on field-relevant terminology, records management, billing, and coding. Students can earn these certificates entirely online or in a hybrid format, which involves taking weekend classes on campus. WCC maintains an open-door admissions policy, and distance learners benefit from affordable tuition rates and financial aid opportunities. WCC offers flexible payment plans, scholarships, work-study positions, and awards for veterans and underserved students. Each year, Johnston Community College enrolls 13,000 students in career-centered academic programs and continuing education classes. The college offers an online medical office administration diploma that prepares students for entry-level occupations as medical billers, dental office secretaries, patient service coordinators, and health information analysts. Graduates can broaden their career opportunities by earning a bachelor's degree from a four-year school or professional certifications from organizations such as the American Academy of Professional Coders. The 43-credit curriculum includes core classes in word processing, comprehensive keyboarding, and office editing. Students gain fundamental knowledge in medical terminology, insurance, billing, ethics, and legal issues. They also learn to manage paper and electronic records using industry-specific filing methods. Coursework also covers procedure and diagnostic coding, with an emphasis on the three major coding systems. Students learn to conduct and evaluate research and to incorporate findings into projects and documented writing. This training provides a foundation for advanced studies in the field. The program culminates in a capstone experience, during which students apply learned skills in a simulated work environment. JCC also offers an associate degree and three medical office administration certificate online programs. JCC offers open admission and accepts most applicants with a high school diploma or equivalent. North Carolina high school juniors and seniors can take courses from JCC through the Career and College Promise Program. The college offers affordable, residency-based tuition rates and more than 250 institutional scholarships. Gaston College enrolls 21,000 students in on-campus and online programs, including two online certificate programs in medical office administration. Students can earn their certificate entirely online and asynchronously through Blackboard. Learners can also take hybrid and on-campus classes at any of Gaston College's three locations. The general medical office administration certificate requires 15 credits and prepares students for positions in health offices and facilities. Coursework covers topics including keyboarding, medical office terms, and medical legal issues. The curriculum also introduces learners to insurance and billing concepts, preparing them to accurately complete a claim and explain processes to patients and third-party organizations. Students can also earn an 18-credit online certificate in medical billing and coding. In addition to the fundamental topics in the generalist curriculum, this track covers advanced coding concepts and methods. Students learn how to implement diagnostic codes to accurately identify and describe injuries, illnesses, and diseases. They also develop procedure coding skills, which professionals use to process specific healthcare services and items for internal documentation and insurance claims. Applicants must submit an online application and academic transcripts. Admitted students complete free placement testing and an online orientation. High school juniors and seniors who reside in North Carolina can take dual-enrollment classes through Gaston College to earn credits that apply toward high school and undergraduate requirements. Gaston College offers affordable tuition rates, and students can apply for financial assistance opportunities including state grants, foundational scholarships, and awards for active military members and veterans. The GC Promise Program covers any remaining in-state tuition and fees for Lincoln and Gaston County high school graduates. Located in Sylva, North Carolina, Southwestern Community College provides distance education programs through Blackboard. SCC offers an online diploma in medical office administration that covers fundamental skills in medical documentation and patient services. Graduates often pursue advanced studies and entry-level positions in dental offices, research laboratories, and insurance companies. Many also earn professional certifications, such as the medical billing and coding credentials from the American Academy of Professional Coders. The curriculum comprises 39-40 credits. Students take core classes in areas including keyboarding, word processing, and text editing applications. Students learn to write clearly in multiple formats and genres using a recursive process. Learners also gain skills in business communications; they learn to produce professional presentations, official correspondences, and business reports. The unique diploma program emphasizes statistics and quantitative analysis. Candidates explore data, hypothesis testing, basic probability, and correlation and regression. They apply these concepts to oversee personal finance and medical billing. Students round out their training with a customer service class during which they learn how to navigate complex professional relationships and stressful situations. Students can transfer their diploma classes toward an associate degree in the field. SCC offers medical office administration certificate online programs in areas including bookkeeping, health informatics, and medical assisting. The college also delivers programs for high school students and continuing education classes for working professionals. All learners benefit from an open enrollment policy, affordable tuition rates, financial aid opportunities, and career services. Established in 1961 as an industrial education center, Pitt Community College now enrolls 22,000 students in curriculum and continuing education programs. PCC offers online certificates in medical office administration that synthesize core communication and research skills with medical and finance knowledge. Graduates often pursue administrative roles in dental offices, community health centers, private clinics, and pharmaceutical companies. Students pursuing their medical office administration certification online at PCC can choose from two options. The 17-credit medical office receptionist program includes coursework in medical terminology and legal issues. Students gain the fundamental keyboarding and computer application skills needed to facilitate professional communications and manage patient needs. The certificate program culminates in a professional development class during which students learn how to apply for jobs and strengthen their resume through networking and additional training. Alternatively, learners can earn an online patient services representative certificate. In addition to core topics, including medical terms and software applications, candidates explore concepts related to healthcare trends, medical insurance, and the billing cycle. Students can apply certificate coursework toward a diploma or degree in areas including medical auditing, medical billing and coding, and dental office administration. Students can enroll in the spring, summer, or fall. PCC provides affordable tuition rates, financial aid opportunities, and comprehensive academic services. Through the PCC career center, students can receive resume help, career assistance, and virtual job shadowing opportunities. Haywood Community College is based in Clyde, North Carolina, and offers more than 30 programs, including online certificate and diploma programs in medical office administration. The programs prepare students for supporting roles in university hospitals, specialty health clinics, and medical laboratories. Graduates qualify to earn industry certifications from organizations such as the American Health Information Management Association. Many graduates continue their studies and earn degrees through HCC or other institutions. Students earning the medical office administration certification online complete 18 credits. The curriculum includes foundational classes in medical legal issues and insurance billing. Students learn to perform administrative office procedures, including processing appointments, orienting patients, maintaining records, and facilitating written and oral communications. The certificate program also explores patient interactions, emphasizing cultural influences and stressors that affect communication and care. The 45-credit diploma program builds on certificate training with additional classes in office editing, writing inquiry, and discipline-specific research. Learners study anatomy and physiology and examine the connections between the human body and common health services and procedures. They also develop an understanding of drug therapy, including major drug groups, their side effects and interactions, and proper administration. The program culminates in a medical office simulation task. HCC students can transfer certificate and diploma coursework into an associate degree completion program. HCC maintains an open enrollment policy and requires no minimum GPA or standardized test scores. Students pay affordable tuition rates based on residency status, and HCC offers scholarships including the Lavender Fund and Finish Line Grant for learners facing emergency barriers to their educational goals. Located in Rocky Mount, North Carolina, Nash Community College enrolls more than 12,000 students in 99 academic programs. The school offers several distance education options, including online medical office administration certificates, and delivers online coursework through Moodle. Students in the certificate programs develop the patient services, operational, and technical skills necessary for entry-level roles. Graduates often secure positions as professional medical coders, insurance claim specialists, and dental office receptionists. NCC offers two options for students pursuing their medical office administration certificate online. The general program requires 14 credits and includes coursework in medical terminology, coding, billing, and insurance compliance. Students learn how to transcribe and proofread medical documents with the aid of computer applications and reference materials. The program culminates in a simulation experience, during which students retrieve and process information in an automated office setting. The 16-credit medical coding and billing certificate program emphasizes healthcare insurance. Students examine the medical billing cycle and learn about coding concepts, form preparation, and third-party payers. They also explore procedure and diagnostic coding, using relevant software to identify, describe, and process medical conditions and health services. The diploma program prepares graduates to sit for industry examinations from the American Academy of Professional Coders. Prospective students submit an online application and, after receiving an acceptance notification, complete a free placement test. They then meet with an academic adviser to register for classes and make career plans. NCC provides affordable tuition rates based on residency status. The college also offers financial aid opportunities, including the Blue Love Scholarship for state residents. Established in 1967 as a technical institute, Beaufort County Community College now provides a variety of curriculum and continuing education programs, including distance education options such as the online diploma in medical office administration. The program's 38-credit curriculum helps students develop the health knowledge and administrative skills necessary to work with medical suppliers, insurance companies, research laboratories, and hospitals. Students complete coursework in areas including business math, comprehensive keyboarding, and text entry and formatting. Learners develop professional editing skills through coursework emphasizing sentence structure, grammar, proofreading, and hard editing. In addition to a medical office simulation, students complete an office administration capstone course that requires learners to apply classroom knowledge to solve common administrative challenges in the medical field. BCCC students can strengthen their skills through the medical office administration certificate online program. Classes emphasize medical coding, billing, and insurance. Additionally, students can apply diploma coursework toward the associate degree completion program, which requires 66 credit hours of coursework and work-based learning through an approved employer. Graduates can bolster their career opportunities by pursuing advanced degrees and professional certifications, the latter of which individuals can earn through organizations such as the National Healthcareer Association. Applicants must establish residency and complete an online application. BCCC offers low tuition rates based on residency status. The college provides resources including financial aid opportunities, childcare services, and career guidance. North Carolina high school juniors and seniors can take dual-enrollment classes through the state's Career and College Promise Program. Based in Jamestown, North Carolina, Guilford Technical Community College enrolls more than 35,000 students, making it the third-largest institution in the state's community college system. The college delivers distance education programs through Moodle, and options include three online medical office administration certificates. These certificate programs train students in medical terminology and fundamental computer processing skills. Graduates can enter the workforce as patient health advocates, research assistants, medical billers, and front desk receptionists. 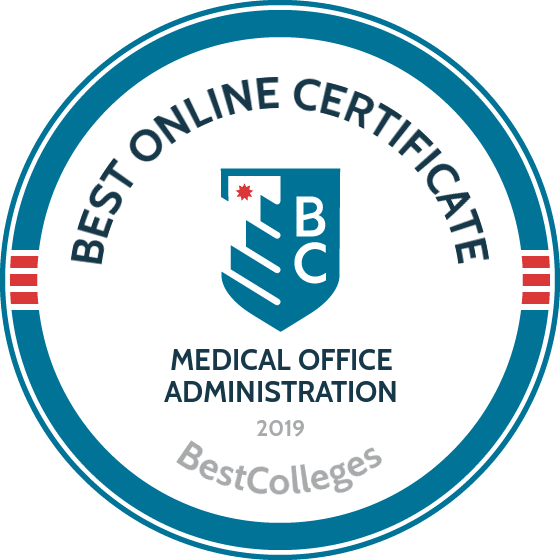 Students pursuing medical office administration certification online can choose the billing and coding program, which requires 18 credits of coursework in areas including procedure and diagnostic coding. Students learn to manage the entire insurance claim and billing cycle. The program culminates in an exam preparation course that helps students earn the certified professional designation from the American Association of Professional Coders. Alternatively, distance learners can enroll in the general medical office administration certificate program. The curriculum builds on office applications skills and knowledge of medical terms. Students learn to create and secure office records, and they prepare to oversee electronic health information, including appointment schedules, patient data, and financial claims. GTCC also offers a medical office administration certificate in healthcare administration that prepares learners for supervisory roles. GTCC maintains an open enrollment policy and does not set minimum GPA or standardized test score requirements. In addition to affordable tuition rates, the college provides low-interest grants, childcare funding, and need-based scholarships. GTCC also offers awards for students pursuing continuing education programs. The college boasts a flexible transfer policy; certificate graduates can apply program credits toward a diploma or associate degree in medical office administration. Medical office administration certificate and diploma programs feature similar courses; however, a diploma program provides more in-depth training and typically requires twice as many credits. While diploma programs equip students with a greater breadth of knowledge, they take longer to complete and are more expensive than certificate programs. Below are potential career paths for graduates with a diploma in medical office administration. Graduates with a diploma in medical office administration pursue healthcare roles such as health information technician or medical transcriptionist. Graduates work in hospitals, clinics, and community agencies, and work hours may follow a clinic's business hours or may include night and weekend shifts at hospitals. Successful medical office administrators possess strong communication and customer service skills, organizational skills, and integrity. Medical assistants record patient histories and personal information, schedule appointments, enter patient information into medical records, and gather insurance information. Medical bookkeepers use booking software, online spreadsheets, and databases to record a medical facility's transactions. They prepare bank deposits, handle payrolls, prepare invoices, keep track of overdue accounts, and purchase office supplies. These healthcare professionals collect patient data and perform clinical coding. They work closely with nurses to ensure the accuracy of patient records and frequently correspond with billing and insurance offices. Medical secretaries ensure that offices operate smoothly. They answer phones, take messages, and schedule appointments. They also arrange for patient hospitalization and may prepare reports for physicians or medical scientists. Also known as healthcare documentation specialists, medical transcriptionists transcribe recorded dictation from doctors and other healthcare personnel. They are familiar with medical terminology and are able to identify inconsistencies or missing information in patient reports. Occupational setting and location, educational level, and work experience influence the annual earnings of medical office administrators. According to PayScale, medical office administrators can expect pay increases of up to $30,000 over a 20-year career. The following table highlights salary trends for common medical office administration occupations. Accrediting bodies regulate the quality of education in the U.S. by enforcing guidelines based on national standards. Accredited medical office admin certificate or diploma programs are typically offered through four-year universities and vocational schools. The most common types of accreditation are regional and national; more than 85% of U.S. universities are regionally accredited. Credits earned from regionally accredited programs are more likely to transfer than those earned from nationally accredited schools. However, nationally accredited programs typically have lower tuition rates and less stringent admissions criteria. While medical office administration certificate and diploma programs are not governed by program-specific accrediting agencies, students may look for accreditation from the Distance Education Accrediting Commission, which assures the quality of online learning programs. Certification in medical office administration is an affordable option for beginning a career in healthcare. Numerous financial aid opportunities exist to further offset the cost of education, including grants and scholarships and federal and private loans. Students pursuing certification in medical office administration should also seek out scholarships awarded specifically to health administration students. Students should complete the Free Application for Federal Student Aid, or FAFSA, to determine their eligibility for federal funding.